How can my company get practical benefit from IoT platforms? The so-called IoT or IIoT platforms play a central role in the Industrial Internet of Things, or IIoT for short. These support all tasks from the acquisition of plant data, storage, visualization, processing and analysis, to the implementation of actions based on the knowledge gained. The respective platform providers provide software components which can be supplemented by individual applications. Since many customers already use Siemens products in their manufacturing environments, we would like to take a closer look at the MindSphere - IoT platform from Siemens, present a concrete case study and demonstrate the extensive application possibilities. MindSphere is provided as a "Platform as a Service" environment and can be adapted to the multitude of application cases and required functional scopes through appropriate extensions and individual developments. Platform as a Service, or PaaS, is a cloud system that provides a computing platform for application developers to eliminate the need to purchase and maintain hardware or software. The low entry costs, already usable services and scalability in particular speak for the choice of this platform approach. The system enables any machine data to be recorded, stored and made available and processed in self-developed applications. Different frameworks (e.g. Angular, .net Core) and high-level languages (e.g. Java, Python) can be used. Also a REST API is provided, which makes it possible to utilize stored data. REST stands for Representational State Transfer and describes a paradigm for web services. The REST API uses HTTP requests to access information. For example, there are PUT, GET, and DELETE requests. PUT creates or changes a resource, GET retrieves a resource, and DELETE removes the resource. Division into North and South - what does that mean? Ideally, an IoT platform is able to connect any type of device via any available interface (OPC UA, MQTT etc.) and to collect and evaluate various data. In MindSphere, the connection of networked systems is located in the so-called southbound. Through the North - the Northbound, on the other hand, it is also possible to integrate applications tailored to the specific application, in addition to Siemens' own apps. These can either be hosted directly on MindSphere or the API can be used for external access to the data in MindSphere. The MindSphere platform provides appropriate APIs for both the Northbound and Southbound, which allows for a corresponding openness of the system. Digitization, IoT and Industry 4.0 are the basis for new and impressive business models and enable far-reaching optimizations in logistics, production and business processes. Nevertheless, these topics are complex technologies that need to be understood and questioned before a further development of one's own business and processes can be implemented. Model structures and prototypes are one way of stimulating the imagination. As you could conclude from the blog article order coffee with BMW-ConnectedDrive and IFTTT from Ingo, we at SWMS like to drink coffee. Therefore we explain the basic possibilities of IoT platforms with a sample project called "Coffee Machine". Did you know? Since the beginning of the Internet, coffee machines have repeatedly served as a grateful application for testing new technologies. At Cambridge University, the first webcam developed there was used to monitor the filling level of a coffee machine via the web, saving employees unnecessary travel. Until 2001, the Trojan-Room coffee machine could be monitored via a webcam. A simple coffee machine stands for a plant, a production machine or a process (hereinafter referred to as a "system") that is to be expanded using IoT technologies. The IoT levels are represented by the coffee machine as follows. The machine does not have any sensors or IoT functionality as standard, which enables communication via the Internet or a local network. For the example project, three sensors are installed in the coffee machine. A temperature sensor measures the water temperature in the water tank and a sensor measures the temperature at the coffee outlet. In addition, an ultrasonic sensor is used to measure the filling level of the water in the water tank. 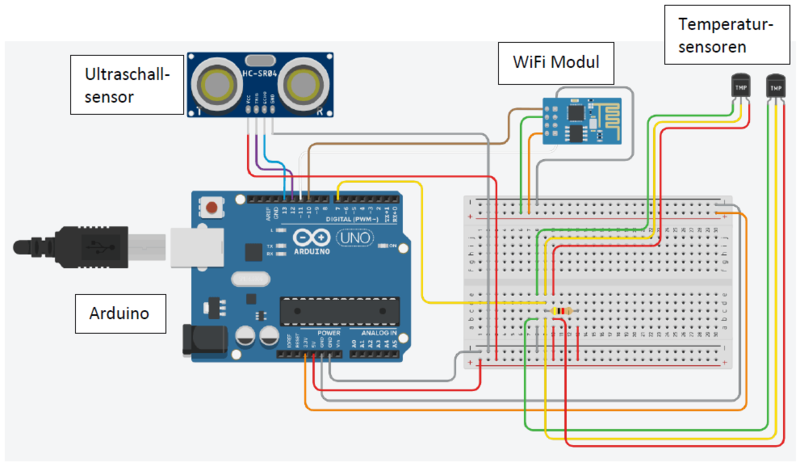 The sensor system is connected to an Arduino microcontroller, which has network access via a WiFi module. A management process is running on the controller, which controls data acquisition and network communication. In reality, systems are equipped with PLC controllers and sensors. However, the collected data is often only used locally for controlling the systems. 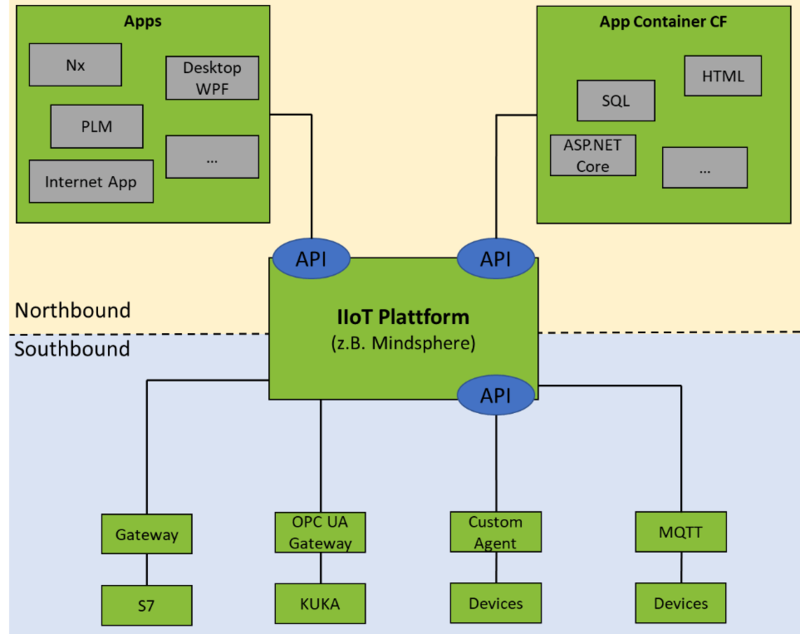 Siemens provides a variety of options for connecting the local system to the IoT MindSphere platform. In our prototypical implementation, the coffee machine communicates with the MindSphere IoT Extension via the MQTT protocol and transmits the sensor values (temperature and level). MindConnect IoT Extension is a MindSphere application from Siemens to easily connect systems without Siemens control (here the Ardunio Controller) to MindSphere via MQTT. The data is stored as so-called Time Series data, i.e. as pairs of sensor value and time stamp. For the first visualization of the data MindSphere provides a graphical interface in the IoT extension as well as in the Fleet Manager. This illustration shows when a coffee was produced. The standard tools can thus be used to create initial dashboards for monitoring systems, which can be used, for example, by a production manager to assess the condition of his systems and react to failures. However, it only becomes really interesting when the recorded data are linked to each other and to external sources. Applications offered by MindSphere can be used for data analysis and processing. It is also possible to host your own applications on MindSphere or to access MindSphere with your own applications. For the coffee machine project, an application based on the Angular Framework was developed that displays the temperature data on a dashboard and converts the fill level into the number of remaining cups. Figure 4 shows the condition before a coffee was produced. Figure 5 shows how the temperature at the outlet (red line) rises. However, the number of cups available in the tank decreases. Transferred to real applications, applications based on MindSphere can display, calculate and predict the condition of machines, among other things. Algorithms from the field of machine learning can also be used to process the data. It is also possible to actively generate alarms and notifications that inform the responsible employees when an event occurs (e.g. a limit value is exceeded). The communication path from the IoT platform back to the system under consideration is not yet covered in this example project. In the future, the collected data will be used to generate control commands that influence the behavior of the machine and thus contribute to the automation of processes. Especially in the production environment it is extremely important to protect data from unauthorized access and at the same time to be able to determine who is allowed to do what with the data at any time. The leading providers of IoT platforms have also recognized this requirement and therefore provide comprehensive security functions for data acquisition, transfer, storage and access. Why is the investment in digitization sensible? The operator/user wants to be able to carry out the actual purpose of a coffee machine - coffee cooking - at any time. For this, it is important that the machine is ready for operation at all times. Of course, the temperature of the coffee and the question of whether there is still enough water to brew it are exciting for this purpose. However, these sensor data are only relevant for "pure coffee cooking". An overview of still available coffee pads, average consumption and average costs and a mobile control system for the machine could also be interesting for the user. We will continue to develop our project in this direction in the future. Two views of the data are important for the manufacturer. On the one hand, the view of many (coffee) machines of the same series is of great interest for corresponding forecasting of failure cases and uncovering any design and production problems that may be contained. On the other hand, the prediction or determination of the failure of a specific coffee machine is of importance for service provision for the actual user. A service provider who is responsible for the provision of coffee for events or in general is interested on the one hand in ensuring the supply of coffee, water etc. and on the other hand in being able to detect failures of used coffee machines promptly or even predict them. One database for everyone - why is that so important! It is precisely these different stakeholders of the coffee machine(s) that have different demands on the data and its intended use. What they all have in common, however, is that they can use the same database. It is therefore of crucial importance to provide all stakeholders with a platform for querying and evaluating your released data. The prompt provision of user data in particular opens up new possibilities in the design of business models. For example, a provider could offer the provision of coffee as a service. All maintenance measures, consumption optimisation of operating materials (e.g. use of coffee beans), trouble-free operation of the machines are the responsibility of the provider, who is only remunerated for cooking coffee according to a pay-per-use model. Further innovative business models are favoured by the consistent use of the data and allow a new type of service-oriented business area to emerge. 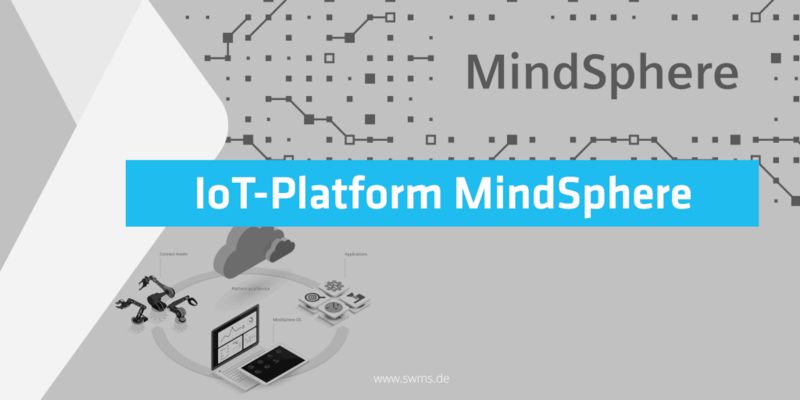 The presented project shows the use of the Platform as a Service Systems MindSphere and shows the connection of sensors and the use of sensor data in a self-developed MindSphere application within. A coffee machine was equipped with different sensors and connected to MindSphere via MQTT. The real coffee machine connected via IIoT mechanisms was then presented for demonstration purposes via dashboard and, in addition to the master data, essential transaction data and their use from different usage perspectives (stakeholders) were shown. 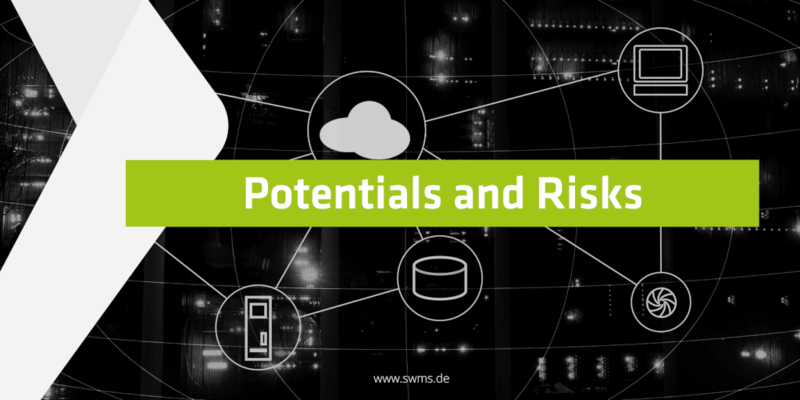 SWMS makes available the know-how for digital change, the use of Internet of Things technologies and the associated ideas and possibilities. The use of innovative technologies raises potentials and achieves tangible results. We support by understanding the requirements of operational processes in service and industry and developing tailor-made solutions. With a holistic approach we advise and enable optimal decisions regarding IT and technology in order to maneuver ahead in the waters of digitalization and industry 4.0. The Democase "coffee machine" will be exhibited as an application example at the Hannover Messe Industrie at the booth of SWMS Consulting (Hall 5, D05). 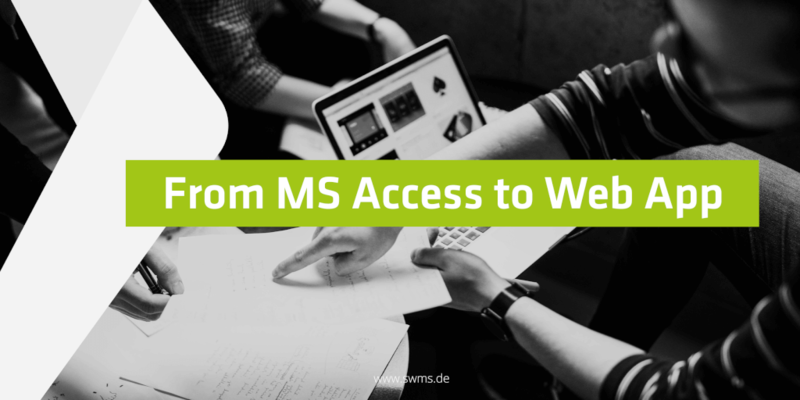 Information about our booth can be found here (https://www.swms.de/en/hannovermesse/).